If you have been trying to work out how it is that some people learn languages so readily whilst the majority end up giving up, you may have come up with some good ideas. The question is of course, are you on the money? Is there maybe a “secret” you may have missed? You may well not have, but as the vast majority of people do struggle to learn a new language, reflecting a bit on what you think or do is probably a good idea. For success, a key idea that most people don’t seem to argue about is the need to be engaged in what you are learning. Whilst there might be some agreement on this, how to achieve it has not been so well explored. Some people focus on outside factors, some of which we may not have full control over, such as the need to learn a language driven by career, geographic, family and sadly enough these days political dynamics. There are other factors we do have control over, such as how we approach what we do. An example of this may be choosing to move towards those activities that attract us and shying away from ones that turn us off. These latter factors, to do with the learning experience itself, are not talked about so much, but in fact are a key that has a direct effect on the level of engagement we experience. A key to making anything engaging is to make the task involved just hard enough. The brain likes solvable problems, problems it believes can be solved. Too easy, and it gets bored. Too hard, and it gets frustrated. Either way, your engagement and attention flags and you lose your motivation to keep going. Think about video games. Do players really care whether the dragons are killed or the princess gets saved? (Well, maybe some of them do. :-)) In general video games succeed in making you work hard to solve problems that are imaginary and essentially meaningless—by maintaining the challenge at exactly the right level to keep you engaged and having you believe you can move forward. Of course with time you do, unless you give it away before the breakthrough! All of us like the feeling of mastery, and we’re willing to work for it. We of course are the ones to choose what we wish to master. Here lies the difficulties at time, when others are the ones who chose what we need to master. This insight has important implications for learning. When we’re learning, whether at school or at the office or on our own time, it should feel like “demanding fun” at times.—an enjoyable activity that requires effort. The enjoyment comes from a feeling of engagement, and ultimately mastery of a skill. When that is on song it feels that every cell in your body is focussed on solving the task in front of you. This only happens if you feel that the challenge facing you is solvable. To stick at it over time there also needs to progress, otherwise the energy wanes and doing something else becomes more attractive. That is unless you have become fixated on solving the problem. A case in point ( one of the more extreme ones) is Thomas Edison who reputedly tried 1,000 times to invent the “humble” light bulb before he succeeded! Just ponder that for a moment! You can easily find other examples of people who did persist far beyond what most people would to achieve the goal they had. Colonel Sanders lived out of his car for a year driving around the States trying to find someone who would try his recipe; American author Jack London received 600 rejections before his first story was accepted; Henry Ford went broke in 5 different businesses before he founded the Ford Motor Company; Vincent Van Gogh only sold one painting in his lifetime, but painted over 800; The Beatles were rejected by numerous record labels before one did; and so on! Admittedly these may appear to be extreme examples, but what it seems to suggest that if you are committed to what you want to achieve and persist then you can. It is hard to get into the minds of people and know what kept them going. Thomas Edison did refer to this very thing when he said, “I never did a day’s work in my life, it was all fun.” So maybe the secret to even persistence is having fun!! Let’s assume that maybe for some it was the vision that kept them going. We know that not everyone has a vision so strong but even if you don’t have, you can succeed and people do. The secret to this is to understand what else can keep us moving forward. One such thing is exactly what we have been talking about. Namely, learning to adjust what we do so what we do stays engaging. We, in fact, can be in full control of this. Infants are a master at this. If you watch them, they will “play” with something for a while until it no longer engages them and then they turn to something else. This play is not just play but in fact, is how they master control over their limbs and thought processes. Once they master something, they will give it away and embark on something a little more demanding. They don’t repeat things endlessly. They will only keep “playing” at something until it no longer serves them. Better understanding engagement is what is required..which brings us back to where we started. Good teachers strive to have their students engaged in their classes and do whatever it takes. Dead Poets’ Society; Freedom Writers; The Ron Clarke Story, Stand and Deliver are some examples of these kinds of teachers that movies have been made about. A much less widely known, but acclaimed educator was Dr. Caleb Gattegno, whose language teaching approach, known as The Silent Way, has engagement as a natural outcome, by teachers subordinating what they do to the learning needs of the students in the class. I am currently developing an APP for the teaching of English spelling that is designed to continuously engage the learners. I will post on this as soon as it becomes available. If you want to keep learning and not plateau, as most language learners do, it’s essential to learn how to calibrate challenges for yourself so you keep focussed and energised. 2) look for patterns in what you are learning. 3) put away your grammar book for a while, and see what you can come to through paying more attention to the language, the forms and the meaning in and around the forms that appear odd to you. 4) put away your dictionary for a while, and see what you can work out for yourself by paying more attention to the clues around new vocabulary. 1) If it’s too hard or you are not making progress, break the task down into the smaller and smaller steps until you can see the problem you face IS or at least looks solvable. Break it down, then break it down again, into micro-steps if necessary. Identify exactly where your confusion/problem occurs. 2) Start with the smallest, simplest piece that you can do and still get right most of the time. Keep practicing it in different ways ( don’t just repeat) until you’re consistently getting close to right as you feel you can get for now and keep working at it till you start to feel a little bored. Then raise the bar. Maybe add a little difficulty, complexity or speed. Use the feelings of boredom and frustration as signals—as guides to managing your motivation. Once you learn how to calibrate a challenge, much less in your learning is going to be “not interesting”. What I wrote about here can only make a difference if you embrace the exercise or it just stays an “interesting” ( or … ) idea. If you attempt to do it but you find it all a struggle, drop me a line or just leave a comment a below. Learning to control what you do so whatever you do stays engaging is something that all good language learners either do instinctively ( as a result of what they went through in their childhood) or have learned to do it as adults. 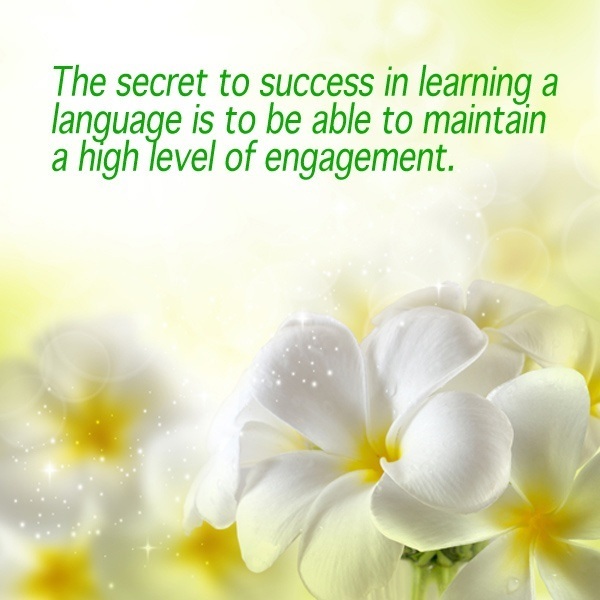 Every successful language learner will tell you that being engaged IS the key, but few recognise it is what they have learned to do that enables them to stay in that state.